It’s true. 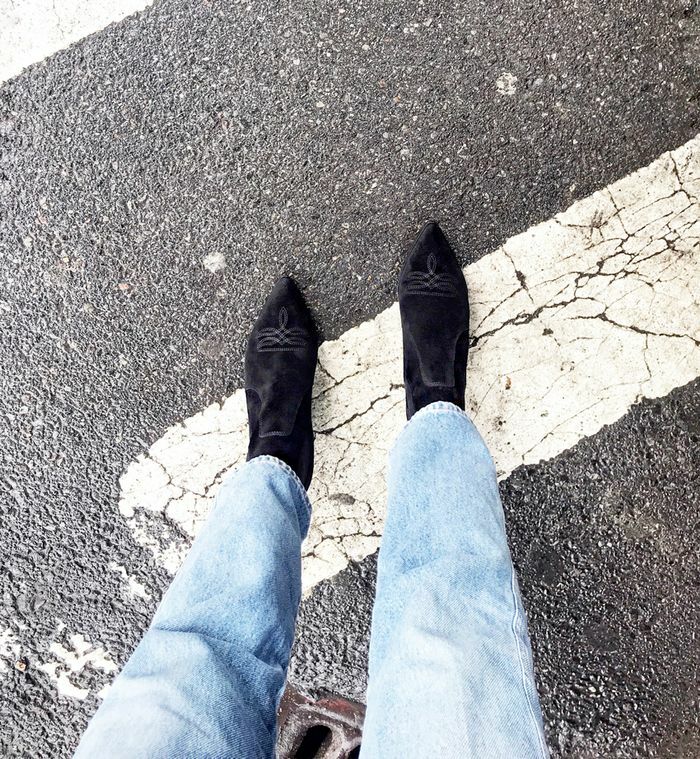 I legitimately own five pairs of black Western ankle boots—and have absolutely no regrets. Even before the Western trend reached its peak, well, trendiness, this season, I was a longtime fan of the shoe style as it’s come and gone throughout the years. That’s why, with much satisfaction, I can still wear a pair I bought three years ago and love them as much as some of my newer ones. Can’t say that about many things, can you? Not only that, but in terms of day-to-day dressing, black Western ankle boots are as easy to style as their more basic counterparts, but do a lot more for an otherwise simple outfit. Last, but certainly not least, with so many brands and retailers on board with them, there are countless options both in terms of style and price point. So, if you’re still unsure how you feel about the style, let me further convince you by simply scrolling. This newer pair by Paige is so comfortable that I've started wearing them as often as I would a pair of sneakers. The soles feel cushioned where the balls of my feet are, so it's like walking on a cloud. Also, they're super sleek and simple, so they go with anything. This pair from Tamara Mellon is arguably the most cowboy-inspired of the bunch, with a higher, wider shaft than the rest. Because of their embossed eel print, they look so luxe in person. I'd say they're ideal for pairing with straight-leg jeans and midi dresses. When in Paris this past February, I splurged on these Dior boots and am so glad I did. Because they're fabric (as opposed to leather or suede), I was able to wear them a ton this spring and summer and have continued to do so into fall. Also, the white detailing and curved heel make them really stand out as special, even at night. Fun-fact: I bought these Saint Laurent boots over three years ago, and they're a full size too small for me, but I got them anyway because they were the last pair available. As you may be able to tell, I've gotten, and still get, my fair share of use out of them. If compliments are your thing, go for this pair by Anine Bing. Yes, they’re comfortable and easy to wear, but they will also have people stopping you on the street multiple times a day telling you how cool your boots are—no exaggeration. Up next: Shop 22 things I actually wore this month.